This photograph was taken at FBI headquarters in Washington DC. 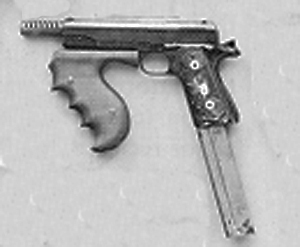 Notice this modified Colt government model M1911A1 pistol in caliber .38 Super. It has been modified to use a Colt Thompson vertical foregrip, extended ported barrel, high capacity box magazine, and fired fully automatic. 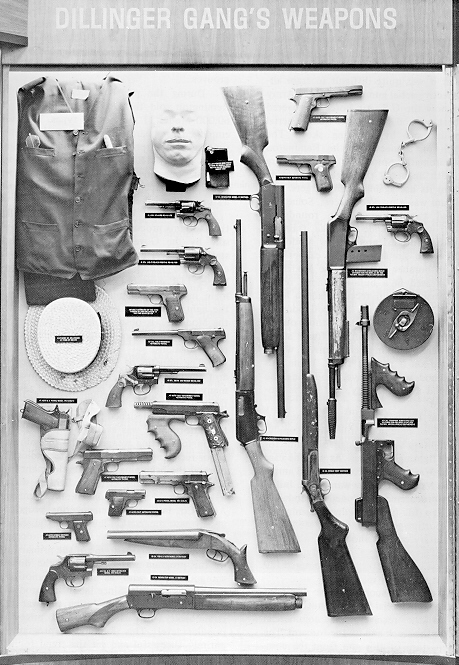 Dillinger sold these as a ‘do it yourself’ armed robbery gang kit. All those guns probably cost less than 1000.00 back then. Dillinger was a good honest criminal -As opposed to all the corrupt and venal police.